[[File:Leeuwarden.jpg|300px|thumb|right|''Source: [http://commons.wikimedia.org/wiki/Main_Page Wikipedia Commons]'']] Leeuwarden (1953 population, 79,960; 1,898 Mennonites in 1947; 2007 population, 92,203; coordinates: <span title="Latitude">53° 12′ 0″ N</span>, <span title="Longitude">5° 47′ 24″ E</span>), capital of the Dutch province of [[Friesland (Netherlands)|Friesland]], was the seat of a large Mennonite congregation (1,020 baptized members in 1956), which was the oldest congregation of Friesland and one of the oldest in the [[Netherlands|Netherlands]]. This congregation can be traced back to [[Hoffman, Melchior (ca. 1495-1544?) |Melchior Hoffman]] who preached here in 1532 among a group of adherents, among whom was [[Obbe Philips (ca. 1500-1568)|Obbe Philips]]; Hoffman's followers mostly belonged to the middle classes. Undoubtedly the [[Anabaptism|Anabaptist]] group at first led a hidden existence. In the fall of 1533 two apostles of [[Jan Matthijsz van Haarlem (d. 1534)|Jan Matthijsz van Haarlem]], viz., [[Bartel Boeckbinder (d. 1534)|Bartel Boeckbinder]] (Bartholomeus van Halle) and [[Dirc Cuper (16th century) |Dirck Cuper]] (Kuiper), visited the group and baptized Obbe Philips and [[Hans Scheerder (16th century)|Hans Scheerder]], 14 or 15 persons being present. The next day both Obbe and Hans were ordained as elders. In the following years there were at Leeuwarden only slight traces of Münsterism. [[Menno Simons (1496-1561)|Menno Simons]] often visited the congregation, the last time in 1557. Elder [[Leenaert Bouwens (1515-1582)|Leenaert Bouwens]] baptized here as follows: 1551-1554, 26 persons; 1554-1556, 34; 1563-1565, 198; 1568-1582, 247; a total of 505.
'']] 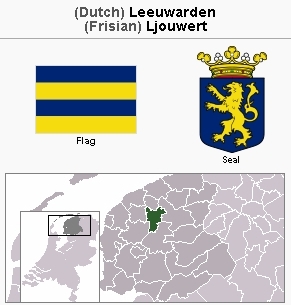 Leeuwarden (1953 population, 79,960; 1,898 Mennonites in 1947; 2007 population, 92,203; coordinates: <span title="Latitude">53° 12′ 0″ N</span>, <span title="Longitude">5° 47′ 24″ E</span>), capital of the Dutch province of [[Friesland (Netherlands)|Friesland]], was the seat of a large Mennonite congregation (1,020 baptized members in 1956), which was the oldest congregation of Friesland and one of the oldest in the [[Netherlands|Netherlands]]. This congregation can be traced back to [[Hoffman, Melchior (ca. 1495-1544?) |Melchior Hoffman]] who preached here in 1532 among a group of adherents, among whom was [[Obbe Philips (ca. 1500-1568)|Obbe Philips]]; Hoffman's followers mostly belonged to the middle classes. Undoubtedly the [[Anabaptism|Anabaptist]] group at first led a hidden existence. In the fall of 1533 two apostles of [[Jan Matthijsz van Haarlem (d. 1534)|Jan Matthijsz van Haarlem]], viz., [[Bartel Boeckbinder (d. 1534)|Bartel Boeckbinder]] (Bartholomeus van Halle) and [[Dirc Cuper (16th century) |Dirck Cuper]] (Kuiper), visited the group and baptized Obbe Philips and [[Hans Scheerder (16th century)|Hans Scheerder]], 14 or 15 persons being present. The next day both Obbe and Hans were ordained as elders. In the following years there were at Leeuwarden only slight traces of Münsterism. [[Menno Simons (1496-1561)|Menno Simons]] often visited the congregation, the last time in 1557. Elder [[Leenaert Bouwens (1515-1582)|Leenaert Bouwens]] baptized here as follows: 1551-1554, 26 persons; 1554-1556, 34; 1563-1565, 198; 1568-1582, 247; a total of 505. Both the first and the last Anabaptist martyr put to death in the Netherlands were executed at Leeuwarden. The first was Sicke Freerks Snyder on 20 March 1531, the last Reytse Aysesz on 23 April 1574. The martyr [[Elisabeth Dirks (d. 1549)|Elisabeth Dirks]], who was executed on 27 May 1549, was a member of the Leeuwarden congregation and is said "to have seduced many persons." Yntema, J. and Nanne van der Zijpp. "Leeuwarden (Friesland, Netherlands)." Global Anabaptist Mennonite Encyclopedia Online. 1957. Web. 25 Apr 2019. http://gameo.org/index.php?title=Leeuwarden_(Friesland,_Netherlands)&oldid=92418. Yntema, J. and Nanne van der Zijpp. (1957). Leeuwarden (Friesland, Netherlands). Global Anabaptist Mennonite Encyclopedia Online. Retrieved 25 April 2019, from http://gameo.org/index.php?title=Leeuwarden_(Friesland,_Netherlands)&oldid=92418.